Prism provides organizations new ways to gain insight into stakeholders’ emerging needs and motivations and then to speed creative strategic response. The process is dynamic. Using “backwards-from-perfect thinking”, focus group participants design the ideal “X” in a dynamic four-step process. After generating characteristics of the ideal “X”, participants list all obstacles and enablers to this ideal. They are then asked to project themselves into the future and imagine they have the ideal “X”. By answering the question — “What happened?” — they generate a list of their current and emerging needs. The tools are flexible, accommodating face-to-face or web-based participation. Focus group results are objectively displayed in a two-dimensional scatter diagram. Product or service characteristics identified as very important but currently under performing are immediate opportunities for an organization to address its customers’ future needs today. 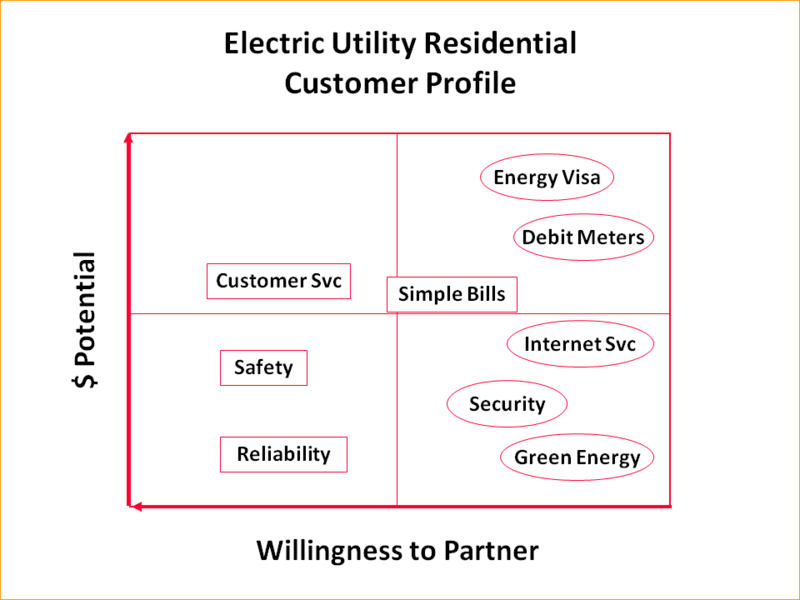 Consider the hypothetical scatter of electric utility residential customers above. Two new product needs (represented by the ellipse) emerge. They want debit meters so that they can buy pre-paid “swipe” cards. And they want an energy credit card capable of earning free kilowatt-hours. They also have an unmet need (rectangle): clearer, simpler bills. Voting results can be disaggregated based by demographic sub-group. 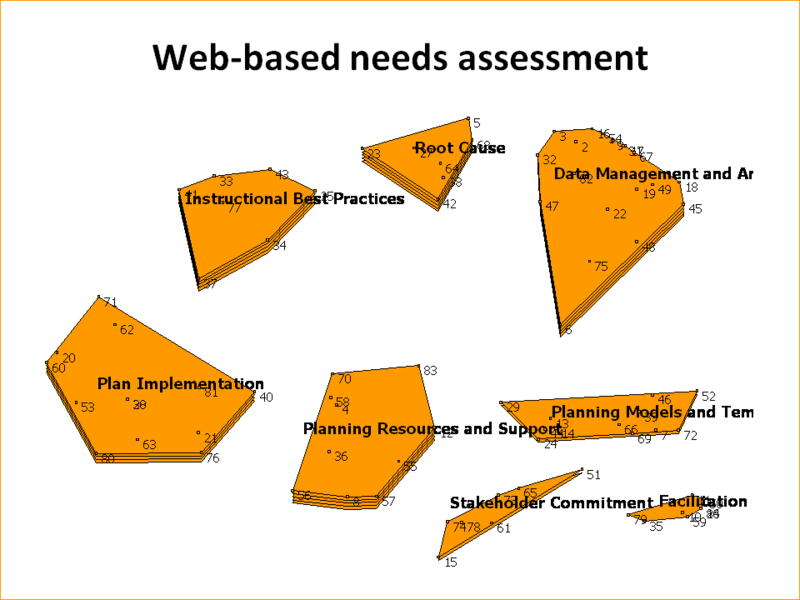 Web-based needs assessments leverage the power of our concept mapping tool. Participants use the same “backwards-from-perfect” process to generate ideas, sort them and rate them from their desktops at their convenience. Results are displayed in the concept map. Importance/performance opportunity gaps are displayed in ladder graphs. Consider the concept map above produced as a result of an online survey of educators’ training needs. The most important cluster of training needs relates to “instructional best practices”. The least important cluster relates to “facilitation”. Prior to this need assessment, the provider was designing and delivering training related almost solely to facilitation. The picture above shows the obvious opportunity gap. 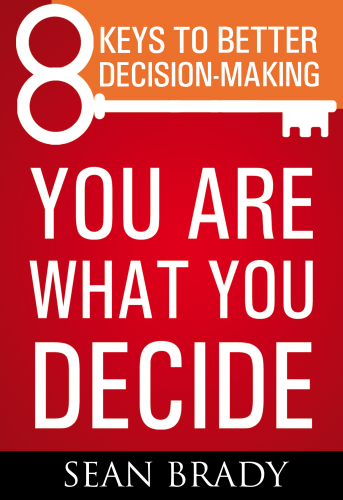 The training was immediately redesigned to meet the customer’s self-identified needs. Prism’s needs assessment process and tools provide insight into emerging customer needs and clear focus for further research or immediate creative strategic response.